The dreaded scratchy throat. A flurry of sneezes. Body aches that leave you sidelined. Tis the cold and flu season. While a barrage of bugs seems to be everywhere you go, you can manage to stay healthy. As we provide neurologically based chiropractic care, we are looking toward the nervous system to see how it is functioning. The nervous system controls everything in the body including the immune system, so if the nervous system is negatively affected, it can lead to the immune system being suppressed. 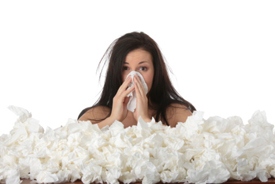 As a result, your body becomes an easy target for colds and flu. According to various studies, the number of white blood cells will increase following a chiropractic adjustment. White blood cells are what fights off colds and flus. If you are already sick or starting to get sick, it’s one of the best times to get adjusted. While taking a proactive approach by getting adjusted regularly is always best, as you can avoid getting sick entirely, you still can receive benefits even if you are sidelined with a cold or flu. Taking supplements is another way to boost your body’s defenses. In particular, we recommend taking higher doses of Vitamin C. If you’re full-fledged sick, you should switch to Vitamin D because at the point Vitamin C won’t offer much help to you. We recommend taking at least 2,000 international units (IUs) a day. In addition to supplementing, sleeping is one of the most powerful things you can do to boost your body’s defenses. Getting good sleep is critical because you’re healing while you sleep. Adults should aim to get 7 to 8 hours of shut-eye a night. One of the simplest and most effective ways of staying well is to wash your hands for 15 seconds at a time. Always use soap and water. Also avoid touching your eyes, nose and mouth when out at public places. If it’s been a while since your last adjustment, there’s no better time than the present to keep your body fortified against the coming onslaught of viruses.